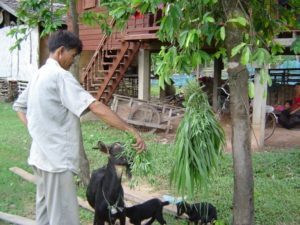 Although goat production in Lao PDR is small in quantity compared to production from other ruminants, goats still play an important role for smallholders in terms of income generation and savings, as a meat or protein source and for traditional ceremonies. The Crawford Fund supported a goat nutrition and management training course on how to improve goat nutrition and other management issues such as pen building and strategic de-worming. 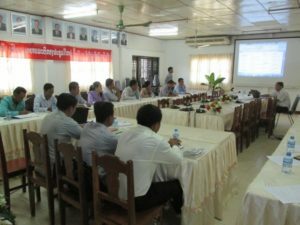 The course was run by the Lao National Agriculture and Forestry Research Institute and attended by 17 extension officers and 6 livestock researchers. The aim was to provide goat husbandry knowledge to provincial and district staff. There are some limitations for goat production in Lao PDR including (1) goats are considered destructive animals to crops, (2) goat meat is not a traditional dish but is increasing in popularity and (3) high mortality of kids, the causes of which are not completely clear but most likely are connected to parasite infection or feed shortage. These factors affect farmers’ interest to raise goats but can be overcome with better knowledge and training in goat husbandry for extension workers and farmers. During the course, lecturers from the Livestock Research Centre (LRC) provided information on goat nutrition and management issues, followed by a discussion on the current goat production systems in local areas in terms of nutrition and management. The participants were then asked to identify the main constraints in existing goat production, particularly the causes of high mortality kids and slow growth of the goats. Possible solutions were discussed by the trainees, such as providing high quality feed to weaned kids, pregnant and lactating does. The types of feed suggested were improved forages and browsing trees. Participants also shared their experiences on goat health problems and management such as the critical time of worming and using local available materials such as bamboo for building goat pens. A field trip was organized to allow participants to identify existing problems and discuss practical ways to overcome the problems and plan for further goat production improvement.